wheremmsgather: Meeting Fellow SCSers and a Beauteous Box! This past weekend I worked the Rubbernecker (RN) Stamps booth at the Rubber Stamping Show in Novi, MI. 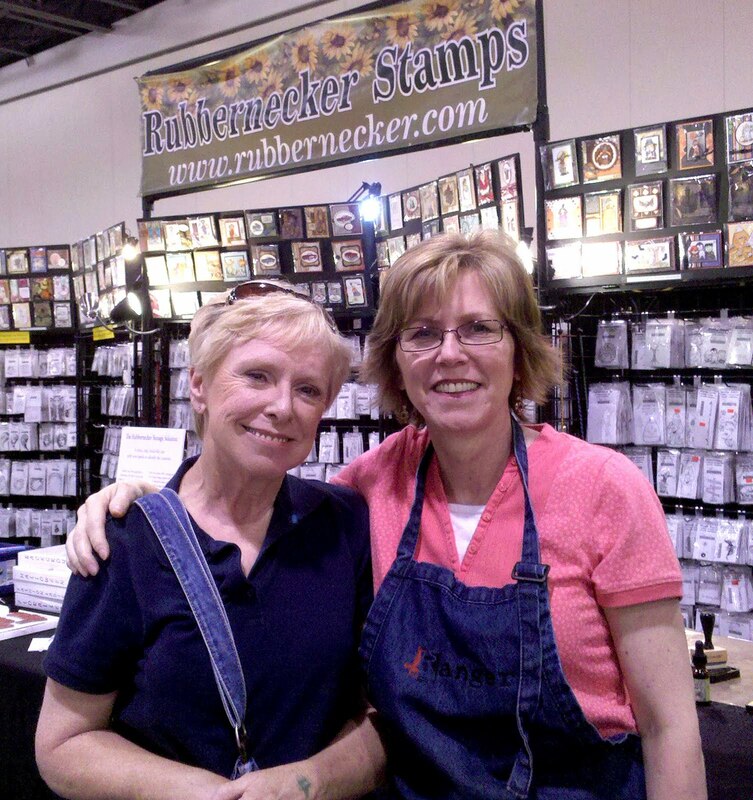 I had so much fun demonstrating, meeting people, and showing off the fabulous RN stamps! Not only did I get to meet the owner, Rubbernecker Dave (sorry, no photo of Dave, per his request), but I also met and worked with Juliana (on the right--known as Julesiana on SCS), a fellow RN design team member. Here she and I are wearing our Ranger aprons (mine was personally signed by Tim Holz!!!). Isn't she just the cutest? She is such a sweetheart; I really enjoyed chatting and working with her. And then......I heard this sweet southern voice behind me.....I turned around and lo and behold Christine (aka whim6915) was standing there!!! Christine and I had chatted on line a couple times and knew that we lived a little over an hour apart. 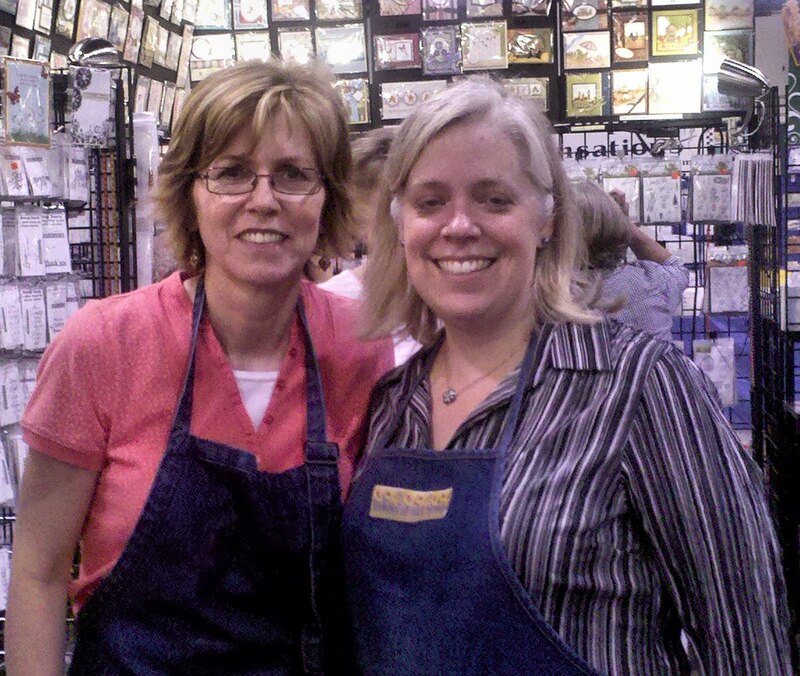 I had told her several months ago that I'd be working the RN booth and that I hoped to meet her. At that time, she didn't think she would be able to make it to the show due to another commitment, so imagine my surprise when she showed up and introduced herself! What a delightfully charming personality she is!! My boss had ordered a set of 10 greeting cards from me. When I realized that they weren't going to fit into the usual clear box I use for gift cards, I decided to make my own box. I split open an invitation envelope box and traced the template onto 12 x 12 black cardstock (thinner than Stampin' Up's so I could fold and crease it). I added Stampin' Up's beautiful Soft Sky designer paper punched with this floral border punch. Then, I made these beautiful paper flowers following a tutorial I found on line. I don't have the link with me right now, but I will add it later. These flowers were so easy to make!!! I added just a touch of turquoise stickles to some of the petals. I made three of them and grouped them together onto the top of my box. I hand cut the leaves and crimped them, adding darker green ink for shading. I then sprayed gold shimmer mist onto the flowers and top of the box for added shimmer. All ten cards and envelopes fit into this box with enough extra room to allow for added embellishments. I was a happy girl! Here's a closer view of the flowers. Sorry about the poor photo. It was late at night when I took this and I struggled to get my lighting right. I finally gave up at almost 1:00 a.m. because I was so tired and needed to get to bed. I already gave the box of cards to my boss (who loved the whole thing), so I can't take another photo. Waving hi from Steamboat!! Where are you?? Charlene, this is absolutely gorgeous, the color combo combined with those stunning flowers...I sure hope you do find the link because I would love to give these a try!! Just curious, how much do you sell those types of gift sets for? Beautiful work, and how fun to see your sweet smiling face, looks like a lot of fun!! Thanks so much for sharing these pictures on your blog, Charlene! Love to see pictures of my SCS buddies and also Dave's setup! Your gift box is gorgeous! Those flowers are just beautiful! Charlene...I think this is the most gorgeous thing on the face of the earth! How beautiful it is! Yah right they were easy to make! For you! They look like a technique to me! Darn it! Your boss better give you a raise, or her position, better yet! Snort! My second comment about the Rubbernecker booth! OMG! You look very professional there in your stamping smock! I love that you were able to experience that...and Dave.....he's a good person, like you! Birds of a feather! come back to Colorado, I am jealous! Wah, it's been one of those weeks - busy, and no internet for most of one day. I did spot this earlier but I had a feeling I hadn't said how beautiful it was. Of course your boss loved it! Who wouldn't. I'll imagine the extra shimmer making it even more lovely. Always nice to fit faces to names, too :D.
You are as sweet in person as you are online!